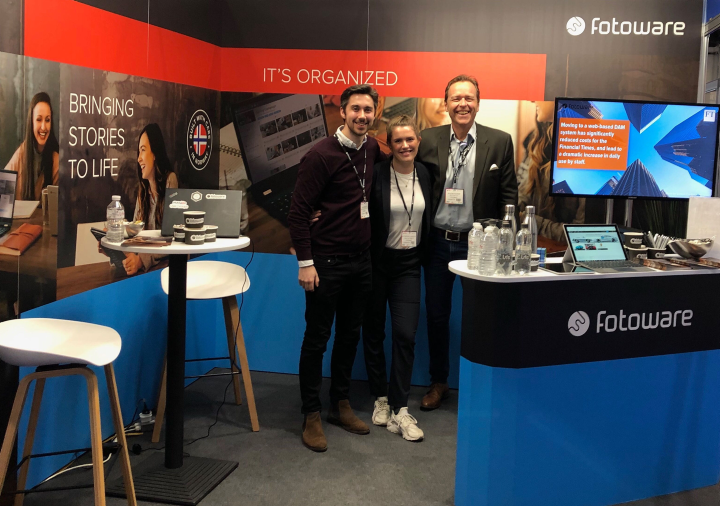 In March, FotoWare exhibited at MTEX B2B Marketing Expo at the London ExCel centre, so we thought we'd share our Top 3 Ways that Digital Asset Management Can Help You Prepare For Business Events. 1. Find Your Files in Seconds! This year, our MTEX project team consisted of colleagues from Marketing, Design, and Sales, who were all tasked with contributing to the planning, designing and creating of materials for the event. At FotoWare, we strongly emphasize the importance of working efficiently, so it's vital for everybody, across all departments, to know where they can find essential files and resources, like logos, graphics, or PDFs, which may be needed to complete the variety of tasks at hand. A Digital Asset Management system is designed to be used as the central repository for all your files, and creating a specific area for the event or project you're working on will save time and energy for all involved. Nobody needs to ask "Do you know where I can find that image? ", because we all know: it's in the DAM. I know what you're thinking... "Do I really need a Digital Asset Management system to do this? Can't I just set up a folder in my favorite cloud-sync solution: DropBox/Google Drive/Sharepoint?" Well, yes. You could do that. But not if you really value efficiency. One of the key features of FotoWare is that your files are not stored in a folder structure. Instead, they're uploaded into an archive and each file is tagged with metadata, like keywords. Metadata is data about data, and what this essentially means is that you don't need to remember complex folder structures or file names to know how to find specific files - you can just search for them using keywords, a bit like searching on Google! You can also create albums in FotoWare so you can quicken the process further where to go to see all the relevant assets for your project. Whether you're attending an event for the very first time or returning year after year, it's vital that your brand's appearance is fresh, up-to-date, and, of course, eye-catching. Without a Digital Asset Management system, the process for doing this could be difficult, time-consuming, and result in causing disruption to other colleagues. For example, let's say you want to look at a previous design from an event; where can you find it? Perhaps you have a folder structure you can go through, but what folder would the designs be filed under, and how can you locate it? Maybe you can ask the Graphic Designers if they know exactly where they stored them, so they can take time out of what they're doing to help look for it? Or just send you the file if they've got it stored locally... It can be much easier and quicker than that, though! For us, using the FotoWare Digital Asset Management system means that finding previous designs and associated assets is simple! 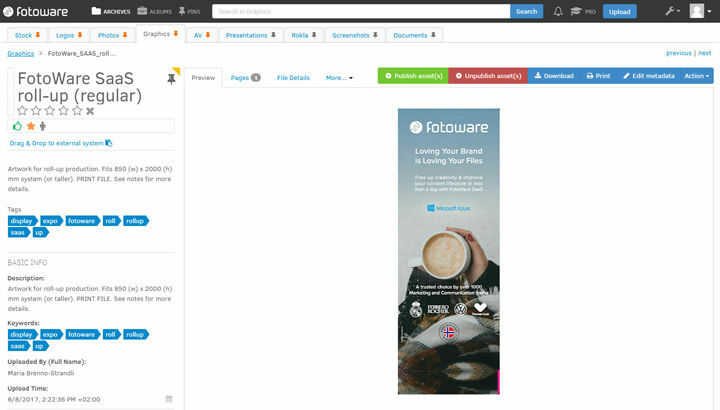 As mentioned, every image created and used is uploaded into our FotoWare Digital Asset Management system and tagged with metadata, so that we can easily find anything when needed. We don't have to worry about remembering complex folder structures to locate files, instead we can just search using the keywords - for example, "Marketing Event 2018" - and it'll pull up results with all the files that have been tagged with it. This means no accidental re-using of old graphics, or images with former employees in them! With over 20,000 attendees and 1,500 suppliers at MTEX, we needed to make sure we caught people's attention while exhibiting. To do this, we armed ourselves with an endless supply of the finest Norwegian candy, loads of cool gadgets for giveaways, a beautifully designed stand along with matching leaflets, and a rolling video of our most inspirational customer stories. All of this required input and feedback from multiple contributors. Without using a Digital Asset Management system, this would mean repeatedly sending different versions through file transfer services like WeTransfer and providing feedback in an email. What's the problem with that? Well, it again takes more of people's time and resources than is necessary, and while it might not seem like much - a few minutes here and there... - it all adds up. In FotoWare, we can also provide feedback quickly and precisely thanks to the annotations feature. This allows us to pinpoint exactly what changes we'd suggest should be made to designs, saving time all round. Feedback doesn't get lost between your emails, Slack feed, Skype chats and WhatsApp group messages - it's all with the image or file in the DAM. And since everyone has access, everyone's informed about what's being suggested and what changes are made along the way. So, there you have it - our 3 essential tips for how using Digital Asset Management can ease the stress of the organization before you go to your next business event. Will you be taking lots of photos at your next event? If so (you should be!) don't miss out on our latest blog post about managing your photos after an event.